I first met Andy Schmidt and was introduced to Comics Experience at the New York ComicCon in 2007. Comics Experience offers beginner and advanced courses in comics writing, coloring and illustration and provides creators with an entry point into the world of comics and provides the tools needed to succeed in the competitive world of comics publishing. I was just starting out as a writer and only had a few short stories published, was just starting to write what would eventually become Sky Girl and the Superheroic Legacy, and desperately wanted to learn to write comics. Unfortunately, the classes were held in New York and I live outside of Washington, DC. I am currently in Andy’s advanced writing class where I am plotting a four issue mini-series about supervillains and learning more about comics than I ever thought could be possible. I also take part in the monthly Comics Experience Book Club (which I highly recommend for both fans and creators as it gives a back stage pass to some of comics greatest stories.) I expect to take even more courses in the future since I still have a lot to learn (i.e., lettering, coloring, etc.). I often joke that if I give Andy Schmidt more money, I will have to declare him as a dependent on my tax return. In short, Andy is a great teacher and has a profound effect on both my writing and how I pursue my writing career (I hope he takes that last part as a compliment). But, I was quite surprised to find that Andy had unknowingly influenced the development of my first novel, Sky Girl and the Superheroic Legacy, which is available from iEnovel (and also has a special promotion at DCBService.com HERE). Sky Girl and the Superheroic Legacy tells the story of DeDe Christopher, an ordinary teen with an extraordinary destiny. She discovers that she is developing powers that are similar to a fictional superhero named SkyBoy. Luckily, her best friend Jason is a self-proclaimed comic geek. Together, they try to learn what is happening to DeDe and must confront the all too real enemies and allies of SkyBoy. In the story, DeDe is an only child who lives with her widowed mother, Dianne. But, this wasn’t always the case. 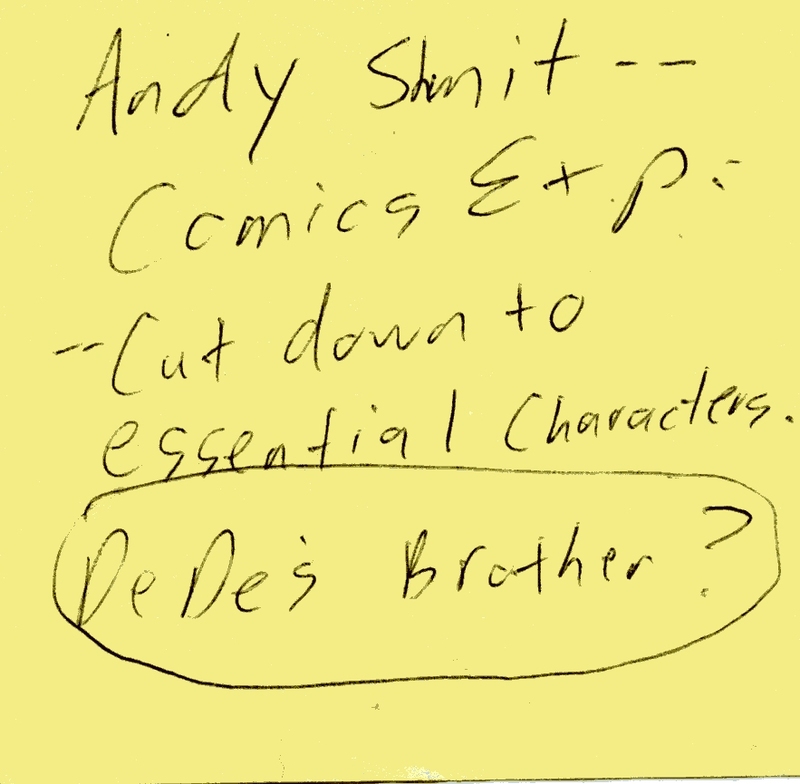 In the first outline of the story, DeDe’s mother remarried and had another child, who would have been around 8 years old (the character’s name was Andy, based on my middle name and not on Andy Schmidt.) I planned for Andy to be DeDe’s pesky little brother, who would serve as mostly comic relief (especially after he learns DeDe’s secret and tries to blackmail her). DeDe’s stepfather, James Peck (Jimmy Stewart+Gregory Peck), was going to be perfect in every way. This would have infuriated DeDe since he had essentially replaced her father. At some point very early on, it became apparent that these extra characters only complicated the plot and didn’t add anything to the main story. So, they were cut from the novel. Imagine my surprise when I found out what inspired the decision to eliminate Andy and James. It turns out that the Comics Experience panel was the catalyst for the removal of Andy and James. 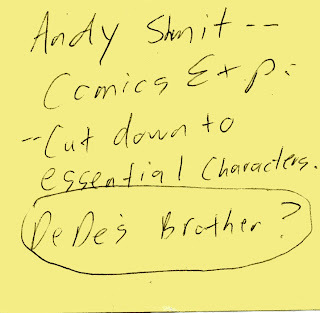 Andy Schmidt was influencing my writing long before I had ever enrolled in one of his classes (or could spell his name). More to the point, Andy, whether he knew it or not, had inspired me to do something that the worst villain would never consider--I single-handedly wiped out the family of a superheroine. I had done more to Sky Girl than SkyBoy’s entire Retallion Battalion put together. Personally, I believe the book was much better after this change. But, that doesn’t change the fact that these characters are forever gone and will never become part of Sky Girl’s world. Thanks to Andy Schmidt and Comics Experience, not only had I become a better writer, but I also had become a supervillain. Joe Sergi is an author that lives outside of Washington, DC with his wife, Yee, and daughter, Elizabeth. He has published short prose stories and articles in the horror, science fiction, and super hero genres. Joe has also written for comics in the romance, horror, science fiction, and super hero genres. Sky Girl and the Superheroic Legacy is his first novel. In 2008, Joe was selected as a semi-finalist in the Who Wants to Create a Superheroine contest sponsored by the Shadowline Imprint of Image Comics. When not writing, Joe works for an unnamed government agency. Joe’s publications can be found at www.joesergi.net. 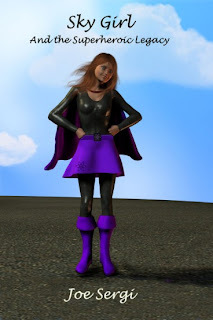 For more about Sky Girl and the Superheroic Legacy, visit the book’s website at www.skygirlnovel.com. Thanks for hosting Joe today. I love this post. 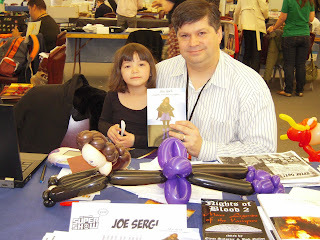 I hope your readers will take a minute to check out Joe's website and learn more about Sky Girl.